Have you ever felt like Jesus was on vacation or lost your address? Have you ever cried out, “God, where are you?” I know I have. And you can bet your bottom dollar, Satan is going to be waiting in the wings to whisper doubts in your ear. The Bible says he prowls around like a roaring lion looking for just the right moment to discourage the wounded believer (1 Peter 5:8). He looks for the opportune time to trip you up and bring you down (Luke 4:13). 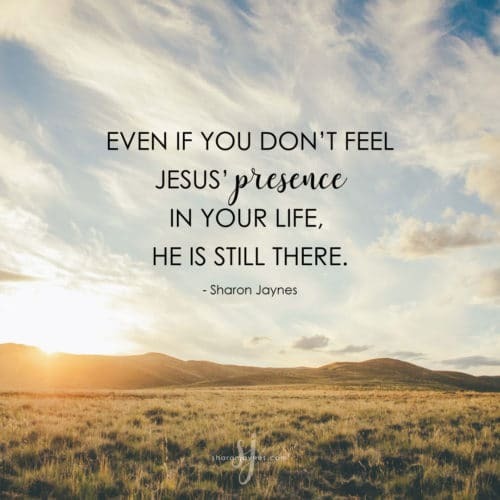 Even if you don’t feel Jesus’ presence, He’s still there. Perhaps you’ve traveled down your own dusty road to Emmaus with circumstances leaving you confused, troubled, and depressed. Perhaps you have been discouraged and wondered: Where in the world is Jesus anyway? If so, remember this my friend, just because we cannot see Jesus or sense His presence, that does not mean He is absent. Click & Tweet! Just because we can’t see Jesus working does not mean that He isn’t. Jesus, thank You for always being with me, for praying for me, and for working on my behalf. Help me to not lose heart when times get tough and the road gets rough. Thank You for never leaving me…no matter what. In Your Name I pray, Amen. When is one time you truly felt God’s presence? Take a moment to share in the comments and encourage one another. There is so much power in your story! 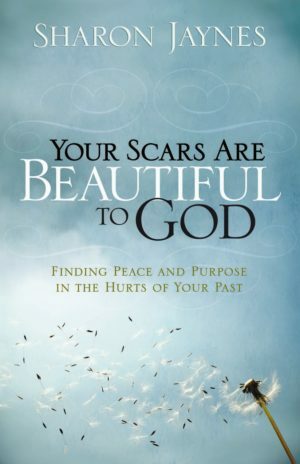 If you would like to learn more about how to turn your pain into purpose, your messes into your message, and your hurt into hope, check out my book, Your Scars are Beautiful to God: Finding Peace and Purpose in the Hurts of Your Past. True freedom comes when you use what you have gone through to minister to someone else. If you have a wound that is yet to heal and become a scar, this resource will help you in that area as well. Thank you I needed this so bad .. Excellent article. Recently I have been greiving the sudden loss of my beloved mother who was my everything in my life. Her death has shattered me mentally and sent me into depression. I was thinking like why God didn’t heal my mom even though we cried out to Him. I felt alone and abandoned for the first time in my life. During this period I cried out to Him asking Him to give me the strength and courage to move forward. I asked Him I don’t know why my mom was taken away but I still believe you are in control and I trust you. Since last few days I started to experience His comfort and peace in my life. I feel assured my mom is in His safe hands and have nothing to fear. Your article rightly points out how God works in our lives though we don’t understand His ways. His promises are true and He always watches over us. Thank you once again for this wonderful write up as it gives me hope and courage to lead a new life. I’m blessed. When my husband and I separated five years ago. I joined a Women’s Bible Sudy on Romans. And through His holy word, the Lord showed me His presence. My desire increased to spend time with Him in His word. To learn the truth for life. I needed this so much today. I lost my oldest daughter this past week. I feel like a piece of my heart has been torn from my heart. I know she is home with Jesus. That gives me some peace. She left a four month old baby boy, Jaxson and two grandbabies seven months old, Evan and Miss Ivory. My heart hurts for them so much but I will make sure they know about her. Thanks again for your message today. Have a blessed week. This message has encouraged me a great deal. I’ve endured as well as caused a lot of pain in my lifetime that many don’t experience. I have always wanted to give my testimony but I despise crying in front of others so I let that hold me back. Someday I hope to heal enough to share these experiences in hopes to help others. As my Mother was taking her last breath in this life, my 5 siblings and I miraculously showed up at her home around the same time very unexpectedly. With my one brother was a family friend who was also a priest who prayed with us over her and told her it was ok to go and that all of her children were there and that my father, Earl was waiting for her. As I stood at the foot of her bed I witnessed her white spirit lift from her body and float away into the heavens. Not all of us experience such an amazing sight, but God knew I needed that in order for me to accept my mother’s passing and to know that she was at peace with Him. My Mother was the most wonderful, loving mother I could have ever asked for and she taught me how to be the same. I will be forever grateful for her and for that gift on that day. Because of that experience and many others since, I proudly walk the walk with our God every day. I believe that sometimes we need those signs from God to push us and continue on our journey with Him by our side. 31 years ago, I had just gotten off my 3-11PM shift working as a nurse in the local hospital. My husband and I were separated and going through a lot. Before I went to sleep, I cried out to God for help and He answered with a touch on my shoulder. He is their for you in every situation and He knows and cares. I pray for all the women out their reading this. God is still in the business of doing miracles. I jus celebrated my 31st wedding anniversary in June. Around 9 years ago my mom was told she had stage 4 aggressive uterine cancer. They told her she had a 20% chance of survival. We learned of God’s healing promises through the book “Healed of Cancer” by Dodie Osteen and decided to stand on the promises. At the time we lived 3000 miles from each other and we would read the promises together each night and praise God for her healing. I was single living in a little studio at the time and one day the sun was shining bright through the window into my 1 room apartment and I started dancing and leaping and praising the Lord for her healing. I was filled with such joy believing what He was going to do for her. I felt His presence of joy and love. My mom is alive and well, completely healed living out her long life. PRAISE the Lord!!!! Sharon I love you. You are amazing. Thank you for each and everything you send me.❤ May God richly bless you. Thank you for the encouraging words❤️ It’s been only a short time since I was in bed for almost a year. I knew that God was near but I tell you I truly didn’t know if I could live one more day! It was tearing me apart to see my son like that.. I then ask God to tell me what to do.that night. The next morning I read a devotional and the title was be still and know that In am God.I knew them I had my answer. I stopped trying to make him go to the hospital.That very same day someone came out from mental health(we had tried befor but he knew how to answer the right questions without showing them what we was seeing. )He agreed that day to go to the hospital, and once at the hospital he displayed all the the symptoms of his delusional and paranoia. He is now safe and getting the help.he needs. Thank You Lord. It’s been several years ago when the Lord laid it on my heart to pray for my youngest son. He was married with 3 small children and had been having some issues with a constant soar throat. After many trips to the doctor they decided to take his tonsils out. Mind you, this had been going on for some time and the Lord through it all had been telling me I needed to pray for him. I did pray for him daily but the Lord would tell me at random times, “You need to pray for David.” When I heard that he was going to have his tonsils out I thought that must be why the Lord is having me fervently pray for him. He had his surgery and was doing fine until several days after he was home. In the middle of the night he started bleeding. My daughter-in-law rushed him to the emergency room and by the grace of God they found someone who could cauterize his throat and stop the bleeding. It was that night we almost lost him from bleeding out. It took him several months to recover from his loss of blood but he’s living proof that God does hear and that I must always listen when He speaks. God is so gracious and I know He walked with us all especially David, that night. God is good! I do have scars, I know that I can help others in the same area but when I do it brings mine all back up and hurts me all over again in some ways! Will it get easier if I just continue to help others and push thru my own pain? Thank you for your message. I constantly fall back into doubt when the answers take years to come! I want to stay strong and everyday I surrender my thoughts and fears to God, but another 24 or 48 hours and no change and doubt begins to raise it’s ugly head. I know the faithfulness of God and he has proven it to me many times. I will wait and see the salvation of the Lord!! I know his timing is perfect! Hanging on to the vine!!! One day after Church I was praising the Lord while driving home, and at home. All of a sudden I felt such a joy that overwhelmed me and I realized His spirit was upon me and all I could sayisI have to tell the world about Jesus. I have since never experienced His presence like that. It was beautiful.